FDP Forum / FDP Unplugged - Acoustic Instruments / Gibson J45 Progressive: it has a progressive bridge. Holy moly, THAT would be cool. I have made several guitars that contain pieces and parts (hardware, pickups, etc. ), made by friends of mine. These are the guitars that have that certain 'extra' something that makes them magical and more inspiring to play. It creates a deeper personal connection to the instrument. I'll give Gibson a week to get back to me and if they don't, then I'll go with Plan B. Probably a bad idea to state that here because Hey Gibson--if you're reading this and you decide to wait me out and leave me flapping in the wind, I will, with extreme prejudice, cease to be your Ambassador of Goodwill. Not only are they reading this, they are hanging on every word you say. And to top it off, they will see what you come up with so that they can incorporate what you guys invent into their next New-and-Improved Progressive model. I look at that saddle "design" on an acoustic guitar and I *shudder* wondering what it's doing to the acoustic tone of the instrument... how does it sound acoustically? I'd be wanting to find a way to drop a bone saddle into that bridge asap. P.S. I have a J-45 Standard and I love it immensely - so no anti-Gibson sentiment - other than "what were they thinking on an acoustic"?! I've seen these cave in on USA Les Pauls. Those guitars have far less string tension than an acoustic. What were they thinking? The LP parts were die cast. It's a unique idea but poorly executed unfortunately. I hope Gibson takes care of this with upgraded countermeasures. It actually sounds really good; it sounds better acoustically than my Taylor 814CE. I imagine a lighter bone saddle would improve the tone even more. A pal brought over a high-end Martin and we compared it to the Gibson. We took turns playing 'em and while each one had its own voice, neither one of us had a preference. Gibson Customer Service replied to my email and gave me two options: ship the guitar to Bozeman, MT for a bridge replacement, or take it to a local certified repair shop for warranty service. I chose door number 2 because I prefer not to ship the guitar, and the shop is 30 minutes away. If they sent me the part directly, the guitar (and the replacement bridge) would go out of warranty. So that's good news...we shall see if this fixes the issue! I've played some vintage Gibsons with the adjustable saddle and they sounded great. These were the U channel type with a standard saddle in the groove. My first acoustic guitar, an Epiphone circa '72, had this style of saddle. There is a smoothness to the other brands you mention that an auditorium bodied Taylor doesn't have. Their dreads seem a bit more focused in the mids. How old is the 814ce? Mine too, 2007. It's just right for some things but not a complete Swiss Army Knife. Is there a Gibby forum to discuss you bridge with other owners that may have had the same issue? There is a Gibson forum, but I'm holding off until this gets resolved. I get it. Rather give the kudos after a customer service success than stir the pot. Good on ya! You don't happen to own a 2007 810ce do ya? That one followed me home earlier in the year when I couldn't find a suitable Martin dread. I saved a bridge from an older Epiphone acoustic guitar that used an adjustable bridge with a steel channel and a standard bone saddle. The guitar was so damaged that the only things worth saving were the old tuners and removed the bridge base with the saddle. The saddle was adjustable by raising or lowering the two screws on either side and thought that maybe in the future I could replace a bummed out bridge on an old acoustic guitar and have the ability to adjust the height. It seemed like a good idea and need to try and find it. It's probably in my parts bin but still think it would be a nice unit to put on a guitar. If I can locate that bridge, maybe I could send it your way! 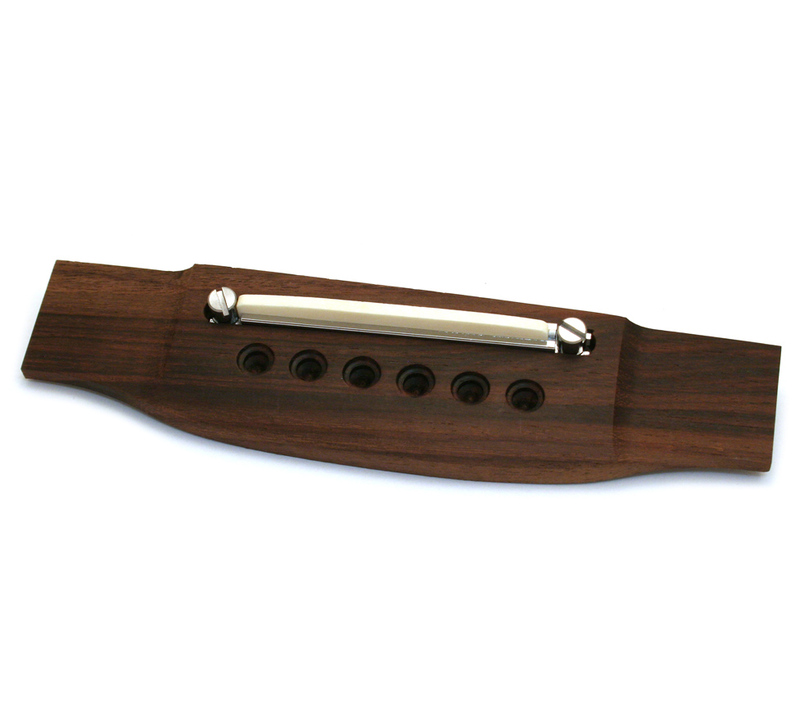 I have never removed a bridge from an acoustic guitar, intentionally, and think this might be a cool piece of hardware to have in your arsenal of parts! Stay tuned and hopefully I can find that unit, if you are interested?!?! Cal-Woody, that is a kind offer, thank you. If it's one of these (see link), I have a few versions of this in my parts bin. But I'm going to go with Gibson's fix. If it's not at least as good as how it originally played and sounded, I'll remove it and make my own bridge insert from rosewood and bone or TUSQ. Yes, it's exactly like the one you pictured. Well, it was something I thought could be used but still need to find it. So far, no luck! Your welcome to it if I ever do find it. Thanks Cal. I probably would never use it because the three I have here have lived in their sad little home (not a guitar) since the 1980s! These bridges are great in concept but tend to remove the sparkly highs from a guitar's sound. I've never encountered a player that preferred this style of bridge over a bone saddle in a slotted wooden bridge. My trick to getting those adjustable bridges to sound better was to lower the frame until it contacted the floor of the bridge route. I would then install a new taller saddle if needed for correct playability. The adjustment screws were modified to clamp the metal frame down to the bridge. My old Epi sounded pretty good but what did I know over 45 years ago. That is a good option. But removing the metal tray improves it even more because it removes mass from the bridge, allowing it to be more responsive to the vibration of the strings. Looks like Gibson is sending the replacement part directly to me. I've decided I'll do the installation myself because I'll probably do a better job than a tech in some shop. I know what it takes to be a "factory-certified repair person" for most of the big names. And it ain't much. It will be interesting to see/hear how the part they are sending you differs from what you've already got. I know. If it's the same exact part that's on it, it's not a fix because these parts are made with cookie cutters: they're all virtually identical. Gibson sent the replacement part. It appears to be powder-coated aluminum. I'm not impressed. Since this was a modification, the rest of the story is in the Guitar Mods and Projects department.